not be to scale. All graphics are property of Lake Front News. 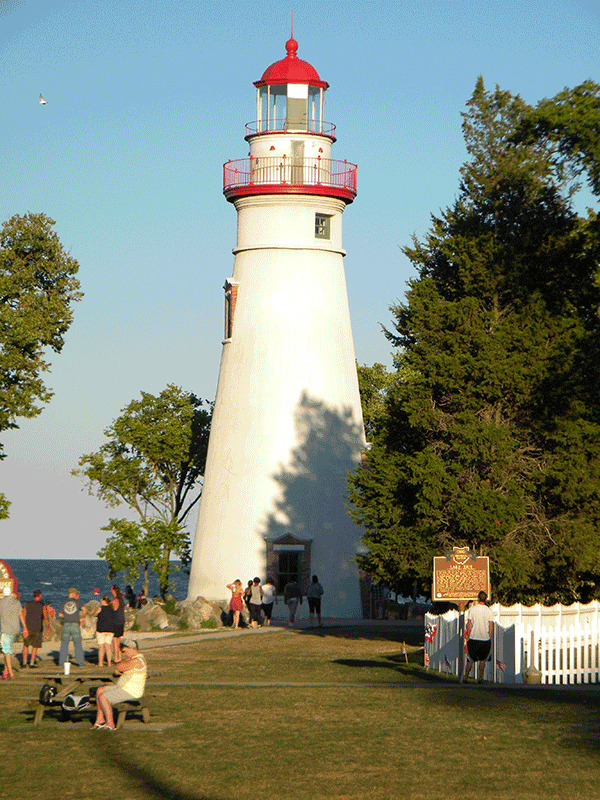 This 65 ft. high tower located on the Marblehead Peninsula is the oldest continuously operating light on the Great Lakes. It had the distinction of representing Lake Erie in the U.S. Postage Stamp series of Great Lakes Lighthouses. Constructed in 1821, throughout history the beacon has changed little. Late in the 19th century, it's height was raised from 55 to 65 feet, but otherwise remains much the same as it did in 1821. A fourth-order Fresnel lens allows it to display a flashing green light. The original Fresnel lens is on display at the Marblehead Coast Guard Station. Although constructed several years after Commodore Perry's famous battle in the area, this lighthouse has shone through it's share of historic events. One was during the Civil War, when more than 10,000 Confederate soldiers were imprisoned on nearby Johnson's Island, within sight of this historic landmark. Diaries kept during that time indicate that many of them looked upon Marblehead's light, and dreamed of escaping to their homes in the South. Even though still active, this beautiful sailor's aide is open to the public on weekday afternoons and various, predetermined Saturdays during the summer season. The Victorian light keepers quarters nearby is usually open on the same schedule.